Reaction of the diazonium cation with cyanide. The phenyl diazonium ion is often introduced early in most chemistry teaching; it is used to produce spectacularly coloured solutions from colourless starting materials and makes an immediate impression.1 The reaction of this species with cyanide salts often appears in introductory courses of aromatic chemistry as a means of producing aryl cyanides. It entered the text books around a century ago as the Sandmeyer reaction (using copper(I)cyanide, but it is also reported as occurring using more ionic cyanide salts as well).2 The mechanism of the ionic reaction however has been given little attention recently. One common representation is as a unimolecular reaction to lose nitrogen gas forming an arene cation, which is mechanistically then followed by fast quenching with cyanide anion to replace the diazo group with the cyano group. Computational modelling of such ion-pair reactions has now become possible,3 and is going to be used here to peek into the future. A B3LYP/6-311G(d,p)/SCRF calculation shows a transition state involving C-N cleavage, with an adjacent cyanide ion doing rather more than merely spectating. The dipole moment of the transition state is 11D (in acetonitrile as solvent). 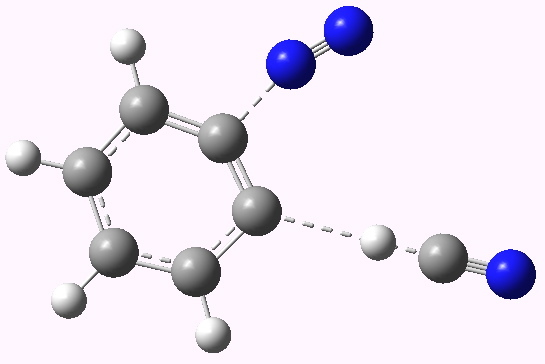 The structure shows the ion-pair endeavouring to minimise the charge separation, with the cyanide approaching at a rather different angle from the departing diazo group. This sort of SN2 displacement at an sp2 (as opposed to sp3) carbon centre is mechanistically quite unusual.4 The free energy of activation for this mechanism is calculated as 24.9 kcal/mol, which is slightly worryingly high for what is considered a room-temperature reaction (the same method gave quite reasonable barriers for another ion-pair mechanism3). So time to see if all is what it might seem. There are many other mechanisms that might be explored; below is what seems quite a reasonable one, the elimination of the diazo-group with accompanying proton abstraction to form a benzyne. This transition state has an activation free energy of 17.8 kcal/mol, a much more reasonable value for a room temperature reaction. The dipole moment is 17.1D (the reactant ion-pair is 19.7D). So could it be that this veritable reaction actually proceeds via a different mechanism from that in the text books? Benzyne would be formed as a very reactive intermediate, and presumably in the presence of cyanide anions, it would react by nucleophilic addition to form benzonitrile, the same product as before. How could this be verified? Well, if the carbon atom carrying the diazonium group were to be labelled as say 14C, the original mechanism would carry all that label at one carbon in the benzonitrile product. But the benzyne mechanism would scramble the label between two carbons. Janus therefore sees the future in the shape of a useful experiment which could be done to distinguish the two alternative mechanisms. It is also noteworthy that the two alternative transition states have different dipole moments, and so are affected differently by solvent polarity. Thus in water, the activation free energies are respectively (substitution/elimination) 25.1 and 17.9, whilst in benzene as solvent they are much higher: 48.7 and 39.0 kcal/mol. The effect of the solvent upon the structure of the transition state is also considerable. 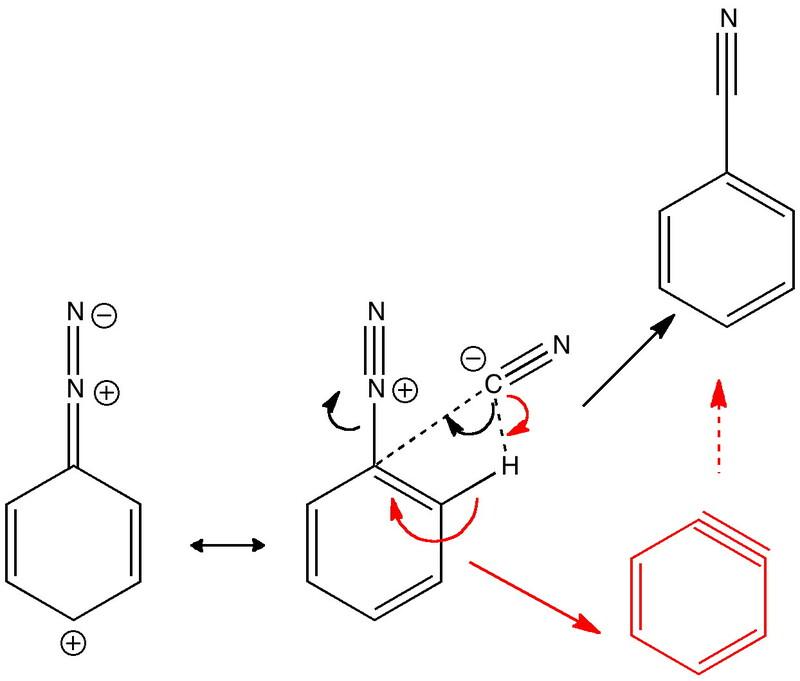 Below is shown the benzyne elimination mechanism as calculated in the non polar benzene as solvent. Note how the proton transfer is much more advanced, and the C…N cleavage is less advanced than in acetonitrile as solvent. We are seeing something of a revolution here. Gradually, the mechanisms of the reaction library built up over the last 100 years or so are increasingly being explored using quantitative calculations. It seems entirely likely that more surprises will crop up. At the age of ~12 I was introduced to chemistry via this reaction, an exposure at least in part why almost 50 years later I am still doing chemistry and why I write this blog. Kazitsyna, L. A.; Gruzdneva, V. N. Vestnik Moskovskogo Universiteta, Seriya 2: Khimiya, 1975, 16, 331-7. This entry was posted on Saturday, December 11th, 2010 at 11:11 pm and is filed under Interesting chemistry. You can follow any responses to this entry through the RSS 2.0 feed. You can leave a response, or trackback from your own site. Hi, Henry: I enjoyed reading your blog and intend to visit again in future. Everything you write makes perfect sense. 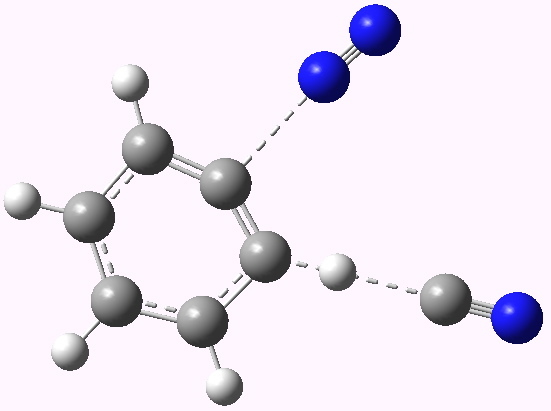 In addition, you might consider this: Add CN to terminal N and form (Z)-diazene. That brings the ortho-H close to the nitrile N. Then do a 1,6-H shift and form benzyne, N2, and HNC. A second route to your benzyne? Greetings from CoMO, Rainer. Rainer asks if a non-ionic pathway might be possible. I think this mechanism is shown below (I made a slight modification so that the more stable HCN rather than HNC is eliminated, see here). The first step couples the ion-pair, producing a neutral intermediate, which might be more stable in less polar solvents. 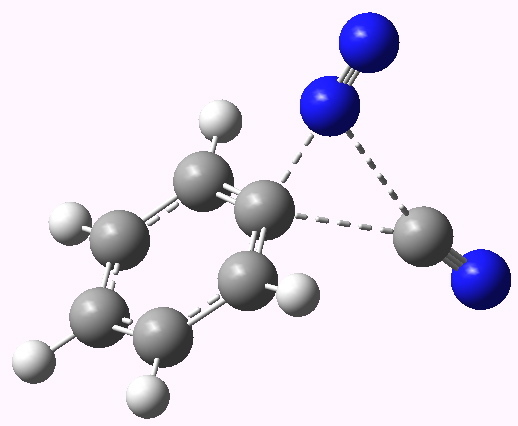 This would then do an ene-like pericyclic to produce benzyne, nitrogen gas and HCN. Entropy would be on its side here. i did the search for such a transition state thus. Firstly, optimize the structure, but keeping the C…N, N…N, C…H and H…C distances fixed at sensible values for these lengths for such a reaction. In particular, the N…N distance was fixed at ~1.8Å. Then search for the transition state using the option of calculating full second derivatives at EACH STEP. This ensures the curvature of the potential surface is always fully computed and not approximated. All my attempts thus far have resulted in the original transition state being located. The N…N distance explodes to ~5å. The only essential difference between the original E2-like transition state and Rainer’s proposal was that distance. Well, failure to find something does not of course prove that it does not exist. Perhaps playing with the solvent (the above was done in acetonitrile), or placing substituents on the phenyl ring might reveal such a transition state. Perhaps another reason is that as shown, it is an 8-electron pericyclic process in an essentially planar transition state. This would be formally forbidden by the Woodward-Hoffmann rules. In effect, the reaction becomes asynchronous and acyclic, by firstly cleaving the N…N bond, and then in a second stage eliminating nitrogen. It does perhaps seem unlikely that a formally non WH reaction could achieve the low barrier required for it to compete with the E2 reaction.